The Libertines have revealed details of their first new album in 11 years after playing a hugely popular surprise set at Glastonbury last Friday night. Pete Doherty, Carl Barat, John Hassall and Gary Powell will return with Anthems For Doomed Youth on 4 September, with the tracklist (seen in full below) including several songs the band have been performing live, such as "Gunga Din". The record's deluxe edition will feature four bonus tracks recorded in Thailand during frontman Doherty's stint at the Hope Rehab Centre to get clean from drug addiction. Doherty told NME last month that he thinks fans are "going to love" the new album. "There's a miracle aspect to actually getting it done and all getting together to do it," he said. "We're all really proud of it." Barat added that the group's style has "definitely moved on" and they are "not just repeating [themselves]". 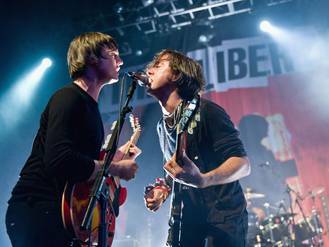 The Libertines first formed in London in 1997 and spearheaded the garage rock revival movement in the UK, rising to mainstream fame in the early 2000s. The group split in 2004 after the relationship between Doherty and Barat became strained (resulting in hit "Can't Stand Me Now") but reunited in 2010 for the Reading and Leeds Festivals. A series of high profile gigs followed last year, notably London's Hyde Park on 5 July. British girl group Neon Jungle has split up after two years to pursue solo projects. Jake Roche and Jesy Nelson were spotted holding hands as the couple left BBC Breakfast studios in London, where Jesy's band Little Mix had been filming. Jessie J returned to the stage on Sunday (05.07.15), despite doctors advising her not to. NME to go free and expand from music into 'brand reinvention'. Nicki Minaj was late to her supporting Wireless set due to “travel issues”, festival organisers have said. Foo Fighters frontman Dave Grohl made a triumphant return to the stage after breaking a leg, performing on a Game Of Thrones’ inspired seat. Damon Albarn was so determined to give fans the best, and longest, gig of their life at Roskilde last weekend that security had to carry him off stage at 4 a.m. The final Sunday album charts were dominated by Glastonbury acts – with Lionel Richie scoring his first British No 1 in 23 years. The Rolling Stones announce biggest ever touring rock exhibition with Saatchi Gallery.